[BBC News] An animal charity based near Bristol has appealed for a skilled machinist to make bespoke pyjamas for an “itchy” horse. Gracie May, a 17-hand heavy horse, suffers from sweet itch, a medical condition caused by an allergic reaction to midge bites. 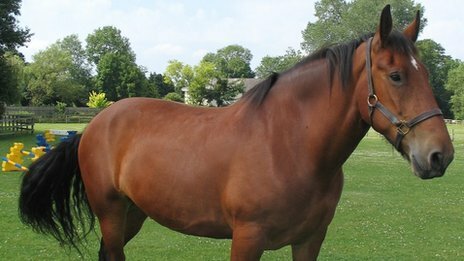 Staff from HorseWorld in Whitchurch said they were struggling to keep her condition under control. There is no cure for sweet itch, the charity said. Karen Hardwick, visitor centre yard manager at HorseWorld, said Gracie May had arrived at the centre in an extremely emaciated condition 11 years ago. She had also lost most of her hair but has now been nursed back to health. “She currently has a rug that protects her when she is outdoors in the fields, but it’s far from being a perfect fit and tends to rub against her,” Ms Hardwick said. “She badly needs something suitable for wearing indoors when she is in her stable here at Whitchurch – a pyjama suit would fit the bill. “Her size is an issue too. She measures 7ft high from the ground to the top of her head. The charity is looking for a business to sponsor the pyjamas, donations towards the cost of making them or a machinist who can make the pyjamas from supplied material.